The World Cup qualifier between Mexico and El Salvador had to be temporarily halted when a swarm of bees invaded a goalmouth at the Azteca Stadium. The match was barely three minutes old when the bees took refuge inside the goalposts at the EL Salvador end. 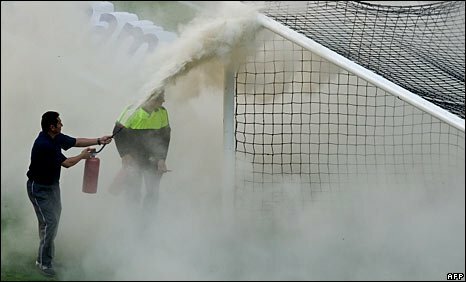 Play was held up for around six minutes as officials used fire extinguishers to clear the insects. Mexico went on to win the match 4-1 to secure a place in the 2010 World Cup finals in South Africa. The Mexicans will finish their Concacaf campaign away to Trinidad and Tobago on Wednesday.